What are they looking at? The latest music video? Glee? Twilight? Nope! 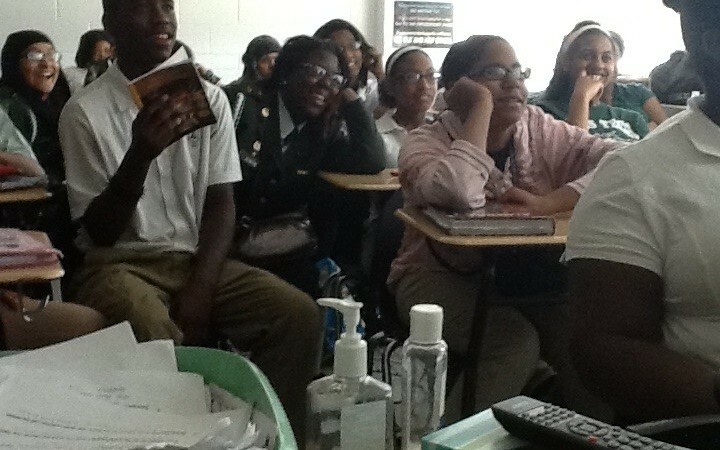 These ninth graders are watching SHAKESPEARE and enjoying every second! They read the play in a “seated reading” first in class. We read and discussed and debated the theme and events in “A Midsummer Night’s Dream.” They looked forward to seeing “Hollywood’s” depiction of a play they believe they completely understood in terms of how Shakespeare wanted the story represented and presented. It’s a good thing for “Hollywood” that these tough “critics” are laughing at one of Shakespeare’s greatest comedies. I am proud of the few weeks between them knowing little or nothing of Shakespeare to the creation of his newest fans!